Pete Dye would probably be the first to admit that, despite winning the base golf championship, his military career was mostly undistinguished. But any decent soldier learns to follow orders. Developers Ernie Vossler and Joe Walser told Pete they wanted “the hardest damn golf course in the world. We want a golf course so hard that people in Japan, who have never been here, will complain about how hard it is.” The architect took them at their word, and made it his business to deliver. 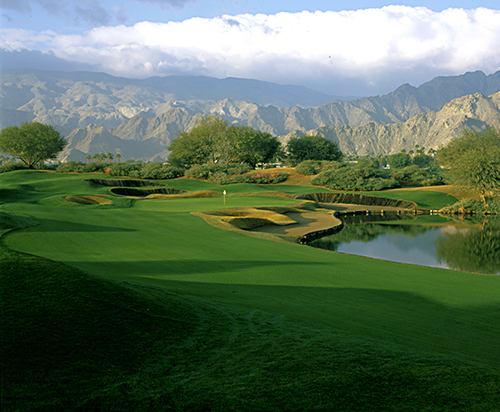 His creation was known as the Stadium Course at PGA West. Well over three decades after it first opened in the mid ‘80s, it continues to beguile and bedevil all golfers who attempt to meet its ferocious challenges. “The worst piece of land I ever started with was this featureless, barren acreage,” recalls Dye. He managed to work his magic on the terrain in the usual fashion, and the swaths of green grass peppered with rock-walled lakes, railroad ties, berms, mounds, sand caverns, and thousands of tree plantings, (including numerous magnificently gnarled mesquite trees,) all surrounded by the majestic Santa Rosa Mountains, make the Stadium Course a real beauty. The only things truly ugly on the property are the predicaments that the resort players find themselves in, their mood as the round progresses, and their scorecard. Al Geiberger, a.k.a. “Mr. 59,” first came to the Coachella Valley in the late ‘50s. He’s lived in residence for many years and has observed firsthand the predictable mood swings of golfers who tackle the fearsome Stadium Course at PGA West. Most of the mayhem was done on purpose. But as has often been the case in his remarkable career, what has become one of the most memorable junctures on the course came about by accident. “I had envisioned a greenside bunker of medium depth on the par-5 16th,” explains Dye. “I told the bulldozer operator to dig until he hit water, but that didn’t happen until the pit was more than twenty feet deep.” The developers were dubious about the penal nature of the hazard, but Dye extricated a golf ball onto the putting surface on his very first attempt, so they let it stand. Of course, Pete Dye was skillful enough to play in the U.S. Amateur, British Amateur, and U.S. Open. The overwhelming majority of golfers stuck within this cavern of doom most assuredly are not. So the twenty-foot-high wall of grass that must be carried to reach the putting surface is as imposing as the Berlin Wall and inspires more praying than the Wailing Wall. Dye once remarked: “No one can describe the jubilation of hitting a shot over the steep bank of that bunker.” Perhaps he meant that literally. No one can describe it because virtually no one can do it. The 16th is merely a stage-setter for the dazzling 17th, known as Alcatraz. This is an island green par-3, but played downhill and surrounded by rocks, a much prettier shot than its East Coast cousin, the island green 17th at TPC Sawgrass. The hole is a little longer, the green a little larger. But the intimidation factor? The heart-and-pulse pounding as a player begins to take the club back? It’s identical. The only difference is the time zone. 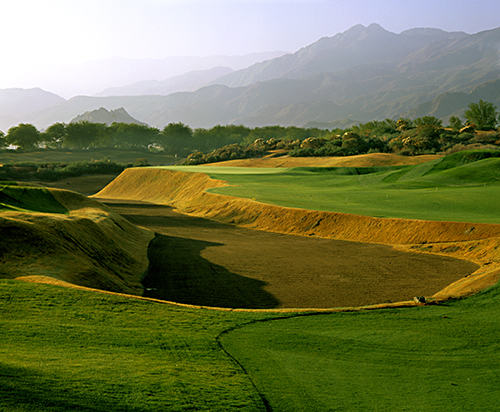 PGA West takes its rightful place as one of Dye’s most difficult, intimidating, yet exhilarating creations.